On July 19, 2016, the Texas Department of Aging and Disability Services (DADS) and SimpleLTC presented a free webinar for Texas long-term care providers entitled, “Texas PASRR: What you need to know NOW – 2016”. (Watch it on-demand here.) Nearly 1,000 providers from all over Texas participated. Due to time constraints, we were not able to answer all the questions asked during the presentation. So SimpleLTC has worked with DADS get answers to all of those questions and we’re now publishing them here as a service to Texas providers. All the answers below were provided directly by DADS (with the exception of the questions referring to SimpleLTC software). For additional information about Texas PASRR, please see the DADS PASRR resources site or SimpleLTC’s Texas PASRR resources page. Special thanks to Cathy Belliveau and her team at the DADS PASRR unit for their work in getting this important info out to Texas providers! 1. Are all care plan meetings to be documented into the portal for the PASRR-positive residents? No, only IDTs should be entered into the portal. 2. Are Private Pay residents eligible for PASRR services, and do they need an IDT meeting? 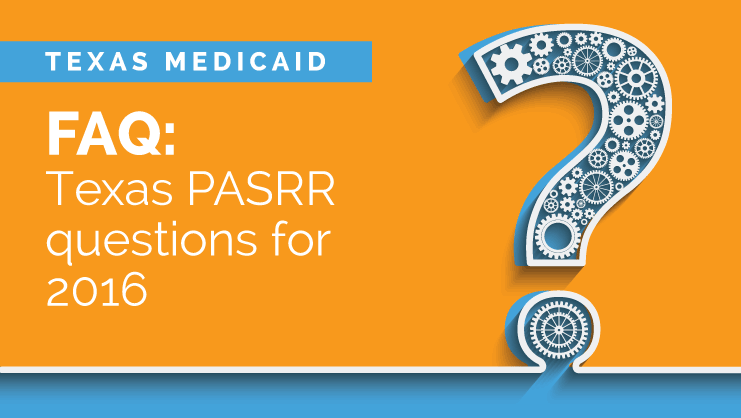 Medicaid or Dual Eligible (both Medicare and Medicaid) are eligible for PASRR services; however, an IDT is required regardless of payment source so that the individual can be given the option to pay for services out of pocket if they choose to do so. An IDT needs to be conducted so that if the individual becomes eligible for PASRR, the requirement to conduct the IDT has been met and your LTCMI will process. 3. Are we to inactivate those PL1s for discharged/deceased residents even if they are PASRR negative? PASRR Negative cases don’t need to be inactivated but it would be the best practice to do so. 4. Why are we not able to create an IDT on some residents who have a Positive PE but aren’t getting specialized services? How do we enter it if there is no “Enter IDT” option? In the LTC online portal, if the PE is positive, the “Create IDT” button should be available. If it is not, please contact DADS PASRR unit. In SimpleLTC, the “Create IDT Form” option appears for forms that have a PASSR Positive PE. If the option is not there, the PE is PASSR Negative and there is no need to submit an IDT Form. If you need assistance, please contact SimpleLTC customer support. 5. Can you please specify what is considered mental illness per DADS? A mental illness is defined as the following: “a schizophrenic, mood, paranoid, panic or other severe anxiety disorder; somatoform disorder; personality disorder; other psychotic disorder; or another mental illness that may lead to a chronic disability.” Depression unless listed as Major Depression is not defined as a mental illness. Dementia, including Alzheimer’s disease or a related disorder, is a neurologically driven disease that through evaluation is not indicative of a mental illness; it is a medical condition. 6. Do I update LTCMI for each death? DADS is asking you to update the PL1 when individuals pass away. PASRR does not address your LTCMI requirements. 7. Do we have to submit IDT information for residents who are negative? An IDT is only required when the PE completed by the LIDDA/LMHA is positive. 8. Do you mark a positive ID/DD/MI with Dementia? If Dementia is the only diagnosis, then the PL1 would be negative. If they also have diagnosis for MI (see question #5) and or ID or DD, the PL1 may be marked as positive. The PE will look for a diagnosis of MI with a primary diagnosis of dementia and the result of the PE may be negative. If the PL1 indicated ID and or DD with a primary diagnosis of dementia the PL1 will still be positive and the PE may be positive. 9. Does a PASRR have to be done every time a person admits to the facility even though we already have a PASRR on file from a previous stay? For every admission, a new PL1 is required unless they had a stay in an acute care hospital that lasted less than 30 days. In this one situation, a new PL1 would not be needed. 10. Does Hospice or Dementia preclude a resident from Specialized Services? Do you mark Positive for ID/DD/MI on a PL1? See the guide for Hospice care that was submitted with the webinar materials. If they have dementia and an MI diagnosis (see question #5), and dementia is listed as the primary diagnosis, the PE will result in a negative evaluation and an IDT would not be held. For ID or DD, the PE would be positive regardless of the diagnosis of dementia. The PL1 should record the diagnosis for MI, ID or DD. The PE will determine hospice or how dementia will impact the results of the PE. 11. Does it have to be an RN when it’s a LPN that does LTCMI? The rule for PASRR states the IDT must include an RN. 12. For Hospice for someone PL1 positive, do they still require an IDT as Hospice trumps PASRR? See the guide for Hospice care that was submitted with the webinar materials. 13. How often does the IDT information have to be entered into the portal? During the admission process after a positive PE has been submitted and no later than every 12 months thereafter. 14. IDTs are for PASRR Positive residents only, correct? IDTs are for PE positive residents. You may have a negative PL1 but for some reason a PE was conducted anyway and it resulted in the person being positive for PASRR. Anytime the PE is positive, an IDT is held. 15. If a person admits from home with or without home health, who does the PL1 and who is the Referring Entity? What about assisted living/group homes? Any admission other than from an acute care hospital should be completed on paper by the person/entity seeking admission. This includes individuals coming from home, assisted living, a group home, etc. The NF can help them by providing a blank copy of the PL1 form and provide guidance on how to complete the form. A positive PL1 result would require the form to be sent to the Local Authority (LIDDA or LMHA) as they will submit the PL1 into the portal and conduct the PE. A negative PL1 can be entered into the portal by the NF. 16. If a PL1 was not done and a resident admits to another facility, what is our course of action in order for the LTCMI to process? If the date of the MDS A1600 and Z0500 is prior to the date the new NF entered their PL1 your LTCMI should process. To ensure there are no issues, you must submit the PL1 within 72 hours of admission. 17. Is there a current PASRR user guide? TMHP publishes User Guides and updates them regularly. They also have item-by-item guides to show you how to submit the PASRR forms. Please see here and here. 18. Must an IDT be submitted for everyone or just PASSR residents? IDTs are required when the PE completed by the LIDDA/LMHA is positive. You may have a negative PL1 but for some reason a PE was conducted anyway and it resulted in the person being positive for PASRR. Anytime the PE is positive an IDT is held. 19. Please go over the requirements that make mental illness on the PL1 positive. 20. Where can I find a paper copy of a PL1 to fill out when transferring a resident to another facility? TMHP maintains Printable Forms on the tool bar of the TMHP LTC portal. All PASRR forms can be located there. 21. You said an IDT is done annually. Is this different than the annual ISP meeting done by LIDDA service coordinator? Yes, the IDT is the NF’s responsibility to conduct and enter. 22. If resident needs PT/OT/ST services, who provides services? NFs should have therapists available on staff or contracted to provide services. 23. Should I be doing a PASRR on all residents who are not in a Medicare/Medicaid-certified nursing home? The requirement is for Medicaid-certified NFs. 24. Does a new PASRR have to be submitted on a readmission even if it was within 30 days? What about inpatient hospice? Or hospice services while in your NF? For every admission, a new PL1 is required unless they had a stay in an acute care hospital that lasted less than 30 days. In this one situation a new PL1 would not be needed. The hospice guide distributed at the webinar will provide the specifics for Hospice admissions. 25. What are the guidelines for doing a new PASRR when there is a change in ownership? A new PL1 is required for everyone if a new contract number is provided. See slide 19 of the webinar for the process. 26. How do I find out who the assigned LA is for a PASRR positive resident? Visit this page or see slide 49 of the webinar. 27. I have been instructed that a resident with a dementia diagnosis will automatically have a negative PL1. Is this correct? 28. Please clarify if a PASRR is quarterly or annually only. 29. Can you clarify the situation with all anxiety disorder and depression diagnoses being a positive PL1? 30. How can I find out if a resident had a previous positive PL1 at another facility? Contact DADS PASRR unit at (855) 435-7180 to request research assistance. 31. I have two residents who were PL1 positive for IDD but have since had a DMR (Determination of Mental Retardation) that revealed that they do not have IDD. Is there a form that will change those residents from a positive to a negative? Do we just submit another PL1? Contact the LIDDA to enter a negative PE. It is their responsibility to correct these. 32. I have asked my LA about holding IDT meetings for residents who are MI only. I was told repeatedly that because they are not eligible for services that an IDT is not needed. Do the LAs know these rules too? Positive MI cases must have an IDT. LMHAs know the rules. DSHS will be notified. Please schedule the IDTs. 33. If a PASRR is >90 days and patient is discharged or deceased, and PASRR was not created, what is the next step? Once the enhancement goes into effect (last week of August 2016) you can enter discharge information on the PL1 to inactivate these cases. 34. If a patient comes to you from the community, what steps do we take to get a PL1 and who fills it out? Any admission other than from an acute care hospital should be completed on paper by the person/entity seeking admission. This includes individuals coming from home, assisted living, a group home etc. The NF can help them by providing a blank copy of the PL1 form and provide guidance on how to complete the form. A positive PL1 result would require the form to be sent to the Local Authority (LIDDA or LMHA) as they will submit the PL1 into the portal and conduct the PE. A negative PL1 can be entered into the portal by the NF. 35. If a resident is PASRR positive for MI and a PE is done and they are determined negative due to dementia, then they do not require an IDT, correct? 36. If my discharge date for MDS is Dec. 4 and the PL1 for the new facility is also Dec. 4 (since PL1 is done day of admission), what does this do to both facilities? Please contact DADS PASRR unit to go over this case at (855) 435-7180. 37. We have a PASRR-positive resident who recently died. I’ve tried multiple times to update the PL1 to show discharged, but shows “PE confirmed and cannot be updated.” What should I be doing? Once the enhancement goes into effect (last week of August 2016) you can enter discharge information on the PL1 to inactivate these cases where the PE has been submitted. 38. What are the steps to change a positive PASRR to a negative PASRR if they don’t have a diagnosis of MI/IDD? It depends on the circumstances. See question #36. The LIDDA/LMHA may need to submit a new PE but you should contact the PASRR unit first. 39. If someone admits hospice and then it is revoked, is a new PL1 needed. Or if they are already a resident and get admitted to hospice, does this require a new PL1? Yes, a new PL1 is needed. Please see the hospice guide for more information. 40. Does a new PL1 need to be submitted when a person comes off hospice? 41. If the PL1 is positive, NF’s are unable to submit positive PASRRs unless an expedited admission, etc. How are we to notify the LA that a PE is needed? Fax, phone call or is there somewhere in the portal we can notify them? NFs can submit expedited and exempted PL1s and negative Preadmissions. Positive PL1s (paper copy) should be faxed to the LA. Visit this page or see slide 49 of the webinar for contact info. 42. Is a new PL1 required for new diagnosis such as Mild MR even when the resident has been with us for three months as a negative PL1? Yes, this is important. ID/DD, once diagnosed or documentation of a diagnosis is received, must be corrected with a Positive PL1. Use Form 1013 to submit requests to enter a new PL1. 43. Should the LIDDA also delay assigning the SC if the NF has still not scheduled the IDT despite requests for it? To clarify, the LIDDA will be able to make this change and not have to rely on the NF anymore to make these changes? Not sure we understand the question. The NF must schedule the IDT. The LIDDA can provide service coordination even if the IDT is not held but the NF will be found to be out of compliance for not conducting the IDT. 44. I have requested to change a negative PL1 to a positive and have not gotten a response. What should I do? Please contact the DADS PASRR unit to go over this case at (855) 435-7180. 45. What if the MH/MR worker does not get the services agreed upon in the IDT started within 30 days of the meeting? NFs and LAs (LMHAs and LIDDAs) are required to initiate services within 30 days. The question is not clear. Please contact DADS to provide more detail. 46. What if the NF does not have LSWK, Activity Director, CDM and have OT/PT/ST aides with limited information to provide the LIDDA? The question is not clear. Please contact DADS to provide more detail. 47. What if nursing sent in a Negative PASRR, then was diagnosed by a psych with diagnosis of Positive PASRR while living in a SNF? If a LPN does the LTCMI and PSARR, does a RN have to do the IDT? Is there a positive PE? If not, the NF must submit form 1013. An RN is required to attend all IDTs in person or by phone. 48. Once the PL1 is positive and the PE has been generated, do I understand correctly that the IDT must be held based on the positive PL1/PE and during the IDT the LA/LIDDA will determine eligibility during the IDT meeting? Our understanding previously was that the LA/LIDDA would determine if the PE was eligible for Specialized Services and then the IDT would be held for eligible PASRR + residents only. Please clarify. An IDT is required when the PE is positive. Specialized Services that are indicated on the PE need to be discussed at the IDT. The IDT may add additional services. Services recommended on the PE should be assessed to determine benefit unless the team agrees they are. The process hasn’t changed. 49. Related to the question about finding no eligibility for someone previously found eligible: when the LIDDAs first started doing PEs in 2013, there was a rush to get many done. It’s very possible that in that rush someone with the potential for ID was determined eligible based on the information available – we erred on the positive side. Some of those people went through the IDD process and were found not eligible for IDD services; so the question of how to show that through TMHP is a valid question. If the PE that was conducted during the data converted process in 2013 was a “false” positive, the LA will need to conduct a new PE. The NF can contact the LA to conduct a new PE or the NF can create and alert on the TMHP portal to the LA to initiate a new PE. Contact DADS PASRR unit for guidance on how to create an alert. 50. Do you have a list to view so the facility knows if they need to delete a resident for discharge/death? DADS and SimpleLTC currently do not provide a list of individuals in each facility who have discharged or passed away. This was an awesome and helpful article. Thank you very much to everyone who contributed their advice and knowledge.